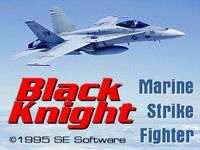 Black Knight puts you in the most realistic F-18 cockpit available without military clearance! Fly missions similar to those experienced by the Black Knights in Operation Desert Storm. It is enhanced with the use of actual photography, a state of the art training mode with speech, more than 50 missions, exceptional graphics, and a hi-res 3D rendering.